Justice League #30 hit the new comics racks this week and brought along with it another one-panel appearance from the New 52 Doom Patrol. Shrouded in shadow, this quintet - yes, QUINTET - seems philosophically opposed to the Justice League or, at least to Lex Luthor championing the Justice League. The art for the issue is attributed to Ivan Reis, Doug Mahnke and Scott Hanna. The page with the DP on it looks to be a Reis page through and through. It appears as though the membership includes Niles Caulder of Ravagers "fame" (upright and mobile, however) someone answering to "Trainor" and three other shady pseudo-silhouettes open to rampant speculation. One is almost certainly Robotman, although not immediately recognizable as the New 52 version as seen in My Greatest Adventure. He looks a little more like the "classic" version of Robotman, but is sporting a jacket with a patch that I can't quite make out. Anyone reading a digital version might have a better chance to decipher it and I'd love to read your speculations. The other two are visibly female. Speculation I've come across is that the figure to the left of the image is Element Woman. 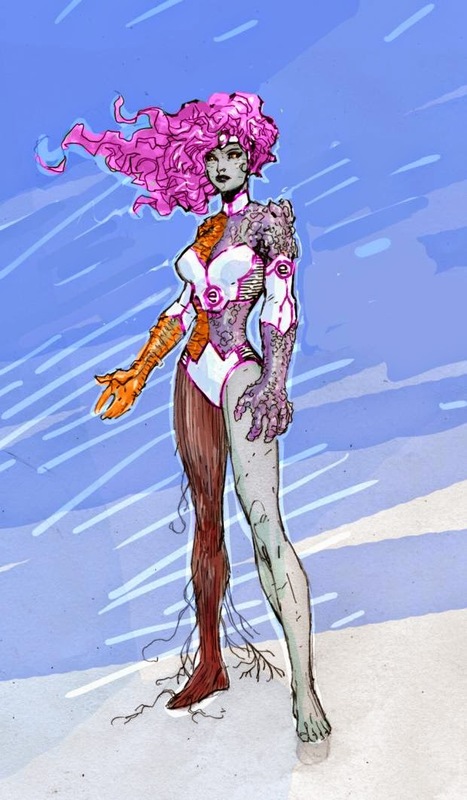 Her addition to the team would help balance the genders a bit and also mix in a tie to Metamorpho's legacy (such as any legacy is in the New 52). Granted, Rex's membership is more tenuous than true, but he always seemed like a proper fit with the team of freaks. The other female form between Caulder and Trainor could be anyone, from Negative Woman to Celsius to Elasti-Girl/Woman. I'm thinking it's going to be Rita, but I'd LIKE to see Celsius pop back up. We saw her in a few panels and Johns gave readers reason to believe she may have been a casualty of Forever Evil, but we never did see a body. So there you have it, Patrollers. New 52 Doom Patrol in the wings. Are you excited? Scared? Inspired? Sound off.